Akathi Suite is of 75 square meters in size. It consists of two bedrooms (including a master room), two bathrooms, and a living room with an adjoining kitchen area. There’s also a fireplace to enjoy vacations the whole year round and a panoramic view of the village. The monumental church of Panagia Pantanassas(Holy Mother of All) dominates the square of the castle Sikinos with its blue domeand gold plated sanctuary. In this spirit, Annasa Suite stands prominently as a 75 square meter large residence with two bedrooms (one master room), two bathrooms and an open space living room kitchen area. There’s also a fireplace and a view of the village. Angel's Grand Suite is a two-storey 105 square-meter home, the largest of the three suites. The ground floor has three bedrooms (one master) and an additional bathroom. 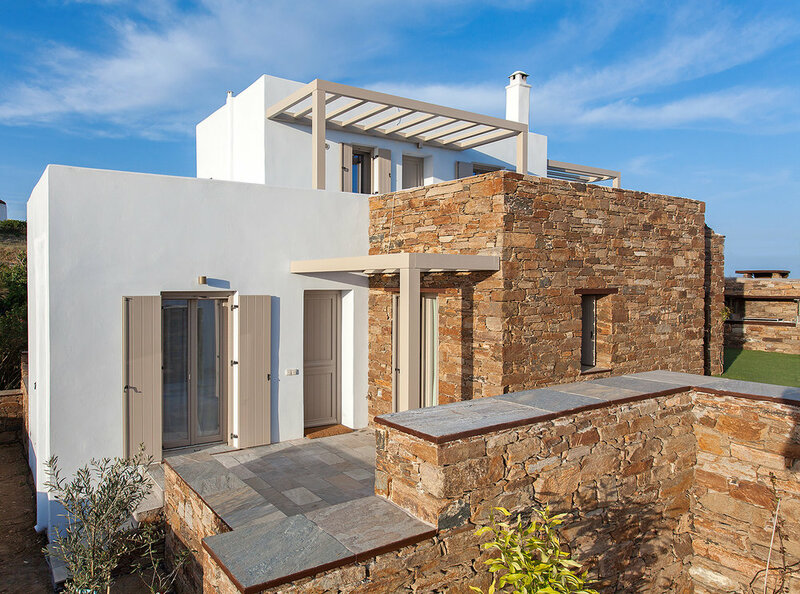 Upstairs, there is a living room are with an open kitchen and many balconies with an picturesque view of the village of Exomvourgo, and the sea as far as Mykonos. Named after the Monastery of “Our Lady of the Angels” (Kyrias ton Angelon) at Kechrovouni of Tinos, that, according to local tradition was built at the suggestion of the Holy Mother herself when three sisters saw the same vision in a dream.